Duvvada Jagannadham's 5 Million Feat - Thanks to the Anti-Fans! First appearance Teaser of 'DJ - Duvvada Jagannadham' emerged as the second fastest to reach 5 million views, standing only next to 'Katamarayudu'. So far, it gained 5.2 million views after being revealed on the day of Maha Shivaratri. While tastes were up to 111,500, Dislikes have been inkling closer to 1 lakh mark. Never been before a Teaser or Trailer Allu Arjun Flick received such a massive response. Thanks to Anti Fans for keeping the buzz alive with the Dislikes disc. This feat would not have been possible without their cooperation. The DJ team was happy with the overwhelming response to the Teaser. 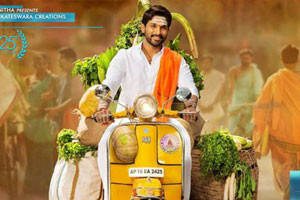 Now film lovers are sure to expect a full meal as Bunny is going to entertain thoroughly as a master chef this time around. The huge buzz around the film has only given a potential blockbuster feel in the making. Therefore, fans can not wait to see the direction of this Harish Shankar more.